Below are the industry's top primers, epoxies, masonry waterproofers, polyurethane enamels and more to service special elements of painting projects. For more on primers, go here to see our blog article "Why do I need to prime?" in Upper Village Life. 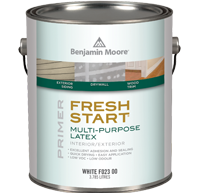 Our Fresh Start premium primers come in both latex and oil based formulations to ensure the best possible results by providing the proper foundation for every finish coat. 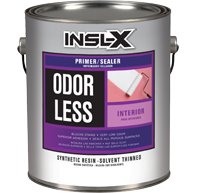 They combine the excellent adhesion and sealing desired in an interior primer with the added benefits of being low odour and quick drying. Choose from specialty products that solve problems with stains, moisture damage, and other common issues. Go here to see the full family of Fresh Start® Premium Interior Primers. 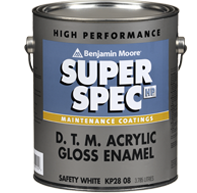 The Super Spec line offers a complete portfolio of primers for residential and commercial use. Spatter resistant, has reliable hide, qualifies for LEED®, low odor, zero VOC. These products are the most widely used coatings for the maintenance business and have been modified to offer additional protection and or application properties. DTM, direct to metal, products that play a dual role as both primer and finish. 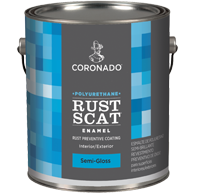 Available in Acrylic, Alkyd and Alkyd with Urethane. 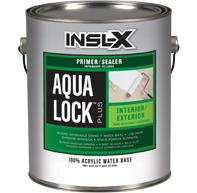 A whole house, universal interior and exterior, water-base stain-killing primer-sealer. 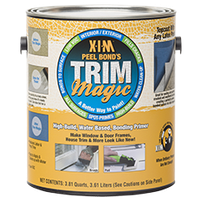 Excellent adhesion to glossy surfaces, including tile and enameled trim. Low odour and easy-to-apply with great flow and leveling. Breathable, flexible acrylic formula resists blistering and peeling. 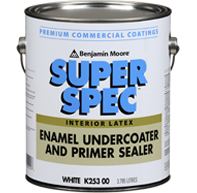 The original pigmented shellac stain-killing primer-sealer. Great for knots, water stains, fire and smoke damage. Best interior new wood primer. Dries in minutes; recoat in 45 minutes. Seals in tough stains, pet, smoke and fire odours. Great under all topcoats. 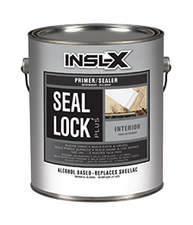 PRODUCT FEATURES: Shellac-base primer-sealer; for interior and spot exterior use; greatest stain sealer; seals knots and sap streaks; seals pet, smoke and musty odors; sticks to all surfaces without sanding; lightning fast dry - recoat in 45 minutes. 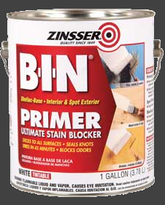 An all-purpose oil-base stain-killing primer-sealer. Ideal for interior and exterior applications. Recoat in only one hour. Great for cedar bleed. May be used under any oil-base or water-base topcoat. Convenient 13-oz. aerosol spray is great for spot priming stains. 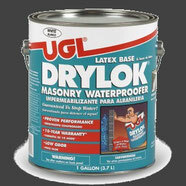 100% Solids Epoxy Pre-Primer is formulated for use on both clean, rusted steel and prepared masonry. For rusted steel where extensive surface preparation is needed, but not logistically possible, the penetrating properties and extended dry time — 16 hours at 77 °F (25 °C) — of this two-component epoxy seal crevices and other imperfections, promoting better adhesion for subsequent coats. 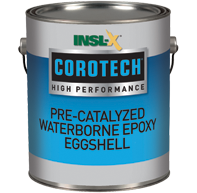 For prepared masonry surfaces, V155 penetrates and seals, providing an excellent foundation for subsequent coats of Corotech epoxy floor coatings. The unique, 100% solids formula of V155 drives out moisture and forms a sealed epoxy barrier that inhibits future corrosion. A premium waterborne extender for Benjamin Moore waterborne premium paints. 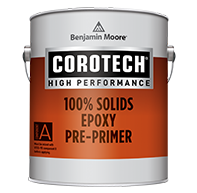 Use as a thinner and open time extender for all Benjamin Moore's interior or exterior latex paints when application conditions require it. 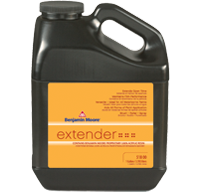 Specially formulated to enhance the application properties of our premium products without adverse effects on dry film properties. Proprietary 100% acrylic. Very low VOC and very low odour. For interior and exterior use. 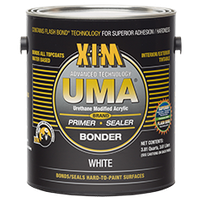 UMA’s advanced technology has both primer and adhesive-like properties. 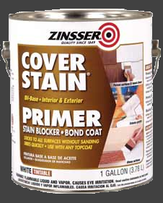 A quick drying, white bonding primer / sealer that provides excellent adhesion. Can be tinted. for tough-to-paint surfaces: glass, tile, Formica, metals, many plastics, wood and other construction materials including Kynar® and silicone polyester pre-coated siding. 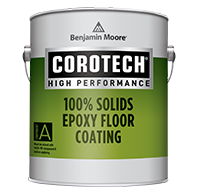 Accepts all topcoats, bonds / seals to hard-to-paint surfaces, excellent wet adhesion, low VOC, low odour. 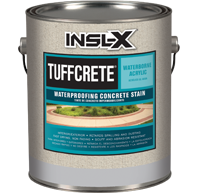 TuffCrete Waterborne Acrylic Waterproofing Concrete Stain is a water-reduced acrylic concrete coating designed for application to interior or exterior masonry surfaces. It may be applied in one coat, as a stain, or in two coats for an opaque finish. Waterborne acrylic formula. 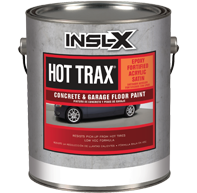 Hot Trax is a high-performance, ready-to-use, epoxy-fortified acrylic concrete and garage floor coating that resists hot tire pick-up and marring common to driveways and garage floors. Hot Trax seals and protects concrete from chemicals, water, oil, and grease. 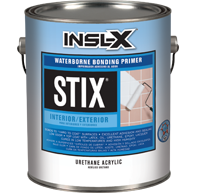 This durable, low-satin finish resists cracking and can also be used on exterior concrete, masonry, stucco, cinder block, and brick. Low-VOC, Resists hot tire pick-up, Interior or exterior use, Recoat in 24 hours. Park vehicles in 5-7 days, Qualifies for LEED credit. 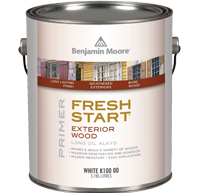 Our line of exterior Fresh Start premium primers ensure the best possible results, especially when sealing and priming new or previously painted wood and weathered surfaces. The need to use these products varies from job to job and can range from problems with stains, moisture damage, cedar or redwood bleeding and other common issues. 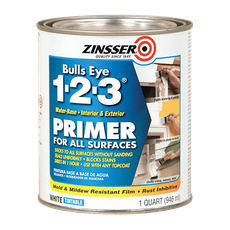 Here are the products to choose from when needing an exterior primer. Go here to see the full family of Fresh Start primers.